IT projects are even popping up in restrooms. In January, two Houston airports began using a variety of technologies to count traffic and help maintenance crews know when to clean the facilities or re-stock supplies. With restroom cleanliness perpetually ranking as a top-five satisfaction factor in passenger surveys, the decision to leverage technology may prove strategic. It also could validate the longtime assertion from IT professionals that technology really can improve every aspect of airport operations. "Making our passengers happy is one of our fundamental strategic priorities," says Jesus Saenz Jr., chief operating officer of the Houston Airport System. "When we launch different initiatives to identify how we can do that, restrooms have always been a top-selling factor." To that end, Houston Airport System recently installed new technology at six restrooms to improve facility operations and customer service. Four restrooms at George Bush Intercontinental Airport (IAH) and two restrooms at William P. Hobby Airport (HOU) are now equipped with the Smart Restroom system from Infax. The system uses a variety of technologies to count passenger traffic and automatically send cleaning alerts to janitorial staff. It also provides dashboard analytics with "last cleaned" data. Installation of the six systems cost about $20,000, plus annual service fees. Because IAH and HOU served as pilot locations for Infax, their costs do not reflect current market prices. Airports purchasing a system directly would incur upfront costs for hardware, installation and software licenses, and would also pay annual fees for system support and data reporting. In addition to the installation of its new product, Infax has supplied flight information display systems to the Houston Airport System for years. IAH and HOU were logical locations for Infax to debut its new restroom system, because the company has supplied the Houston Airport System with flight information display systems for years and is considered a longtime partner. The pilot launched in January, just in time to serve the influx of travelers for this year's Super Bowl, which was played in Houston. Given the importance that passengers place on clean restrooms, more airports will likely choose to leverage technology to exceed their expectations in this ever-important area-especially in an era when customers are quick to share negative reviews via social media. Beyond its business in Houston, Infax recently signed a contract for a pilot program at a Canadian airport. The company is also reportedly negotiating with three other U.S. airports that are interested in using the Smart Restroom system "We are targeting multiple markets for this technology," notes Tracy Davis, the firm's business development director. "We're in discussions with a lot of stadiums as well." Like some airport parking systems, the Infax Smart Restroom system can be connected to digital signs that inform passengers how many stalls are vacant and indicate when the restroom was last cleaned. Signs can also be programmed to display that information about open capacity in nearby restroom locations. The system's interactive tablets allow passengers to complete surveys and report problems. "This gives the passenger an easy way to have a voice," Davis explains. Passengers can tap one of six icons regarding various aspects of the restroom and enter a comment if they wish. Maintenance personnel instantly receive text message alerts when a problem is reported. "You'd be surprised at how many people actually take advantage of that comment section," says Davis. "They gave us amazing data." Receiving instant detailed feedback allows for a speedy response, adds Saenz. Prior to installing the new restroom system, Houston airports did not offer passengers any feedback tools specifically focused on restroom quality. Now, the airports can quickly change a negative experience into a positive one, he notes. "We are no longer interested in reactive information. We have the ability to receive real-time, actionable information and provide the level of service that we want our customers to have." At IAH, two tablets were mounted inside restrooms and two outside to see if the location of the interactive units impacted passenger use. To date, it has not. 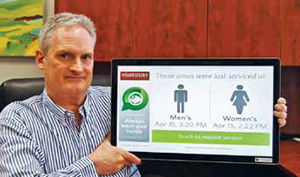 Within weeks of installation, the system had collected more than 4,000 passenger responses (about a 5% response rate). The emphasis on passenger satisfaction regarding restrooms reflects the overall mindset about service at Houston Airport System, notes Saenz. It's not enough to merely be a stopping point for travelers trying to get from Point A to Point B, he explains. "Our thought process is, whether you are an arriving or departing passenger, we want to provide the amenities-restrooms, concessions or any type of service-that reflect a five-star global experience." One might assume that passengers only use the interactive system to report problems, but that's not the case. "We actually get a lot of people pressing the happy face [icon]," reports Davis. Houston ranks in the high 90% in terms of positive ratings." Per its contract, Infax monitors data collected by the smart restroom technology and provides regular reports to the Houston Airport System. Even before the recent technology pilot, Houston Airport System was already renovating all restrooms at all of its airports. Together, IAH and HOU have more than 100 restrooms; and the system also includes Ellington Airport, which serves general aviation, military and NASA traffic. At IAH, computerized systems were installed in two recently renovated restrooms and two of its oldest restrooms. The two restrooms at HOU that received the smart technology were selected because of their high traffic. Currently, Saenz and his team are evaluating the vast amount of data they have received in just a few months using smart technology in restrooms. "The information we're getting is invaluable," reports Saenz. "We've found immediate efficiencies in the utilization of our staff. We know during certain hours we're going to have X number of flights arriving, so we'll have X number of passengers arriving. The planning and scheduling we can do based on that information is extremely helpful. We're also maintaining the holding areas around these restrooms better." Now, the issue is deciding how much and where to expand the program later this year. Like George Bush Intercontinental and William P. Hobby Airport, Edmonton International Airport (YEG) is on the cutting edge of restroom technology. The Alberta airport installed "smart systems" in two facilities during a pilot in 2015 and within seven months deployed the technology in 12 of its high-traffic restrooms. "Airports are judged, in large part, on their cleanliness, including the cleanliness of their restrooms," explains Shalendra Singh, general manager of YEG maintenance provider Carillion Canada. "Restrooms are the first thing people use when they get off an airplane, and the last thing they use before boarding an airplane." maintenance team if cleaning or other service is needed, and messages are received almost instantly via email. WANDA also tracks how long it takes the maintenance team to respond, which employee responds and what tasks were completed. Visionstate, the Edmonton-based company that supplies the interactive technology, originally marketed the system to shopping centers. John Putters, the company's chief executive officer, explains that WANDA was primarily developed to help retail stores prevent slip-and-fall incidents and the lawsuits they inspire. Before WANDA, stores had poor (or no) records of restroom maintenance schedules to use in their defense, he explains. It quickly became apparent, however, that keeping close track of restroom service intervals and tasks completed was just one of WANDA's strengths. The system also collects valuable traffic data. At YEG, the information helps Carillion fine-tune its staff schedules and be proactive rather than reactive about stocking soap, toilet tissue and other supplies. "WANDA helps us learn the traffic trends and coordinate staffing so we can use our resources properly," says Singh. "The biggest thing I see is the quality of cleaning has gone up and the accountability of my staff has gone through the roof." Perhaps the biggest indicator of the technology's effectiveness is the significant drop in emails the maintenance staff receives. "When we first installed WANDA, emails were flowing in rapidly," Singh recalls. "They slowly decreased, because our maintenance team was more on top of things. We dropped from 60 to 70 per month to about 20." In addition to YEG and retail stores, more than 30 hospitals in Canada and the United States use WANDA systems.